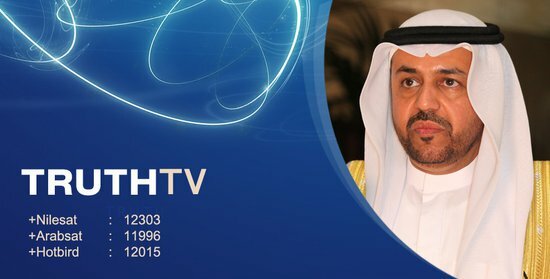 TRUTH TV channel was established in 2005 by his Excellency Sheikh Mohammed Bin Rashid ALHASHIMI, a businessman from the gulf, Arabian investor and the owner of Alhashimi international group for development and investment. It is officially aired on the 1st on November 2005 from the Jordan media city in Hashemite Kingdom of Jordan. The channel's aims are to educate the society, medically, intellectually, socially, educationally and sports wise according to the right curriculum. The channel calls for the proper morals and good handling; it discards differences and myths, rejects political negative attitudes, and rejects what is contrary to the doctrine and standardization. TRUTH TV company for TV, cinema and media production, is the founder of TRUTH TV channel which is a limited company owned by his Excellency Mr. Mohammed Alhashimi and it has International branches in France and the United Kingdom and the United Arab Emirates and the Sultanate of Oman, Saudi Arabia, Kuwait, Bahrain, Yemen, Sudan, Lebanon, Tunisia, Egypt, Morocco, Algeria, Jordan, Syria, Mauritania, Qatar, Iraq, Turkey, Libya, Palestine and Somalia. The company activities are: Production and film making of programs, series, movies, technical and distribution services and all media services. Truth Television is also a general TV channel from the UK. TRUTH TV give you more news, more entertainment, more of everything you would come to expect from a TV channel. TRUTH TV is a television source for wellness of mind, body and spirit. Truth TV is dedicated to bringing the latest most effective information to you, your family and friends, to use in a practical way to take charge of your wellbeing.